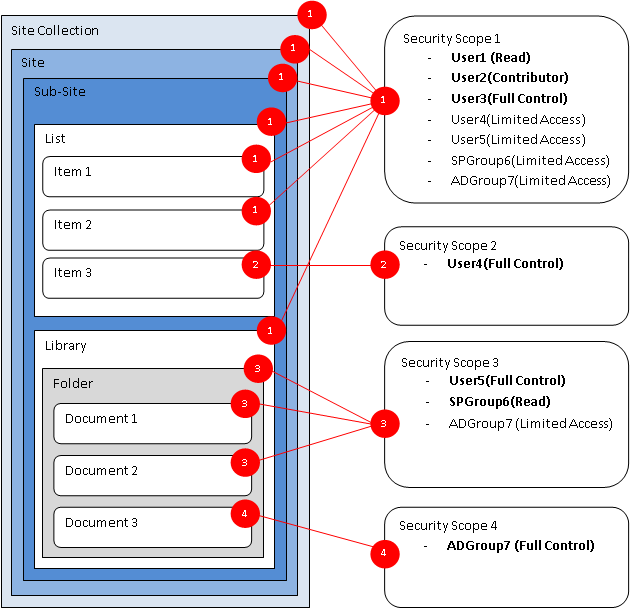 This post is the fourth in a series where I introduce concepts and considerations for security in Microsoft SharePoint 2013. These articles serve as an introduction to those new to SharePoint or to those that have SharePoint up and running but are looking at built-in features and third-party solutions to secure their sensitive information. Understanding SharePoint permissions and using them effectively means you need to understand the concept of "security scopes" and their limits. When unique permissions are assigned to a container or item, SharePoint creates what is called a security scope. This is an important concept to understand because there are limits to how many security scopes can be created, and there are limits to the size of the security scope before SharePoint performance starts to be adversely affected. Each site collection initially contains one (1) security scope, related to the initial permissions at the site collection level. Each time permission inheritance is broken a new security scope is created. So, in Figure 1 above, the “Demo” site collection has four security scopes: one at the site collection level, another at the site level, another on a library, and a fourth on a document. All other sites, libraries, documents and items in the diagram inherit their permissions and therefore no security scope is created for those levels. The size of the security scope refers to the number of principals in the security scope. Remember, a principle is a user, group or claim. To view another example, refer to Figure 2 below to see how security scopes are created as permission inheritance is broken. In previous versions of SharePoint, there were various limits documented around how many security scopes a library or list should contain before performance would be adversely affected. These numbers tended to vary depending on the article and there was a lot misunderstanding around them. In SharePoint 2013, each list or library can contain up to 50,000 security scopes before performance begins to be impacted (this change actually came about in SharePoint 2010, Service Pack 1 and the latest cumulative updates, but it has only been documented in SharePoint 2013). This is a significant improvement over previous versions and when you think about it, it’s a very large number to work with. This means that a single library can have up to 50,000 documents or items which each have their own unique permissions. In addition to this, a library can also contain other documents which inherit permissions from the library level (or site or site collection). If you do plan to modify this setting to support more unique permissions, ensure that your environment is sized appropriately to handle the additional query load. As well, ensure that you test your environment under realistic conditions with this setting in place to ensure that users will not be affected by potential performance issues. Another important limit to understand in SharePoint is the size of the security scope. The size of a security scope refers to the number of users or groups assigned with unique permissions for a particular scope. Limits on this size have remained consistent between SharePoint 2010 and SharePoint 2013. Each security scope can contain a maximum of 5000 principles. This means, each time you specify unique permissions on an item or document there can be no more than 5000 users, groups or claims specified. Once again, in reality this is quite a large number to work with. When permission inheritance is broken and unique permissions assigned to a particular item, let’s say a document, SharePoint will automatically create what is called a ‘Limited Access” permission on its parent and all the way up the hierarchy up to the root site collection. The Limited Access permission will contain the same principles (users, groups and claims) as the unique permission assigned, however using the pre-defined Limited Access permission level. The purpose of this Limited Access permission is to give the user just enough permissions to navigate to the item on which they were just granted permissions (even if they did not have access to the folder, library or site previously). This occurs automatically, as part of the process of assigning unique permissions. The challenge with Limited Access permissions is that they never get removed or cleaned up in any automated way. Even if you cause a particular document or item to re-inherit permissions from its parent library, the limited access permissions will remain in place. Therefore, it is important to monitor how many Limited Access permissions are created because this does contribute to the limits discussed in the previous section. Figure 2. SharePoint security scopes are created when permission inheritance is broken. There has been quite a bit of literature written in recent years about security scopes and their limits, not all of it accurate. I highly recommend that you review the latest document from Microsoft (link above) on the limits in SharePoint 2013 because that will be the most up to date documentation. Thanks for an excellent article. Are there other limits to the total number of security scopes except for 50.000 per list or library? E.g. is it safe to design a solution with 100.000 security scopes within one site collection if spread across a number of sites and libraries?